← Manganese and Lyme Disease! Very Interesting! Posted March 22, 21013. 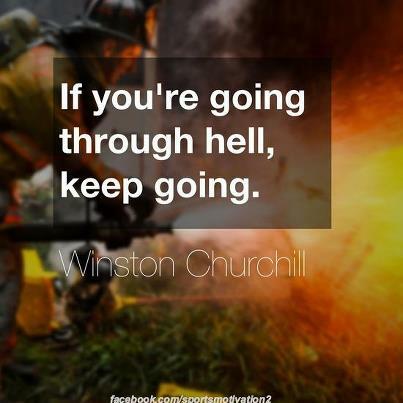 Winston Churchill was a smart guy. I know you’re in agony from your Lyme disease and Lyme symptoms, I know your joints are killing you, I know you feel like a thousand needles are stabbing you, I know you can’t work, I know you have no energy to fight for disability, I know you feel like you cannot take one more pill, I know it’s not fair. I know you’re in Hell. But here’s something else I know, you gotta keep going. I made it out of Hell and I’m cheering you on. This entry was posted in Lyme Symptoms and tagged Inspiration. Bookmark the permalink.